For many, the word Bedouin stirs up vivid images of shifting sands, colorful flowing robes, and the long, loping strides of a camel. The way in which the Bedouins learned to adapt advantageously to an environment as inhospitable as the desert is a marvel of anthropological and artistic ingenuity. Drawn from the Nance Collection—the largest collection of its kind outside the Middle East—Traditional Arts of the Bedouin introduces visitors to a rich material culture from Saudi Arabia and nearby Middle Eastern countries such as Egypt, Syria, and Yemen. 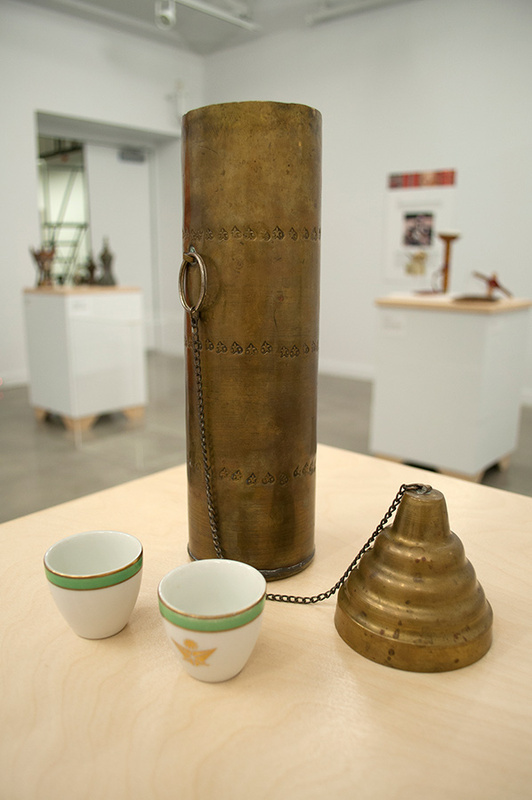 The exhibition includes approximately fifty-three artworks and artifacts, from elaborately embroidered textiles and embellished metalwork to ceremonial coffee accouterments and incense burners; as well as several photographs depicting Bedouin craftspersons at work. The essence of Bedouin culture is understood through its impermanence —with constant movement across the sands of both time and space. Visitors to the exhibition will learn how Bedouin arts and crafts frequently bridge the gap between aesthetic and utilitarian purposes, as well as recognize the unique tenacity of Bedouin traditions in an ever- changing political, social, and environmental landscape. For instance, the Bedouin can be seen as the world’s original “recyclers,” for whom each and every medium was something to be used and reused. Examples of this repurposing of media can be seen in jewelry made from coins, or wire repairs on wooden bowls. Bedouin crafts also require the knowledge of natural environment that has developed over the centuries. Animals are bred not only for desert survival, but also for their hair, skin, hoof, and bone, while other natural materials such as clay and acacia wood are used for everything from pottery to writing instruments. Traditional Arts of the Bedouin reveals the Bedouin to be artists illustrating a legacy of incredible work, not widely known outside their own cultures. The featured jewelry shows each artist’s use of obscure techniques, such as crenellation, to produce intricate pieces. Bedouin weaving, still crafted on a stick loom, demonstrates ancient knowledge of natural dyes and fibers, and traditional patterns; while the women who create textiles use native stitches, not known outside the Bedouin world, to embroider meaning into the objects. For over a decade, Dr. Amber Clifford-Napoleone has curated the Nance Collection, which is owned and housed by the McClure Archives and the University Museum at the University of Central Missouri in Warrensburg, Missouri. Dr. Clifford-Napoleone is Assistant Professor of Anthropology at University of Central Missouri, where she specializes in textile and ethnographic collections, as well as interpretation and ethnography. Her most recent museum publication, “A New Tradition: A Reflection on Collaboration and Contact Zones,” was published in the July 2013 edition of Journal of Museum Education. Traditional Arts of the Bedouin is touring June 2016 through May 2019. The dates below reflect seven-week exhibition periods. Dates are subject to change; please contact MoreArt@maaa.org or (800) 473-3872 x208 for current availability.